On first visit for site survey this garden comprised of existing Indian sandstone patio with raised bed between patio and sloping lawn. The garden was surrounded by a 1.5M old unstable wall which gave a view into neighbouring gardens. The soil in the garden was of poor quality and compacted past 100mm when dug. The sea was close by but not close enough to cause problems with salt. The house faced North and the back of the garden due South. After a few hours at the drawing board and using the information devined, the first draft concept garden design and budget were accepted by the client. 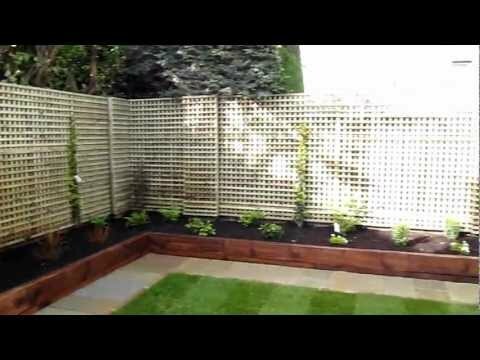 The garden design briefly comprised of a surrounding 2.2M Hit and miss fence, natural stone raised beds, circular Indian sandstone seating area, Pond, waterfall, bog and new lawn. The water-feature and bog were the first. The pond was dug to a depth of 1.3M in one area then a depth of 0.8M to create a good environment for fish and aquatic plants. The excavations were used for the waterfall making sure not to mix the sub-soil with the topsoil. The whole surface of the pond area was then blinded with 25mm of plastering sand to provide a cushion for the liner and to avoid sharp edges puncturing the liner. The liner I use on all water features is EPDM rubber, its the most expensive but the best. 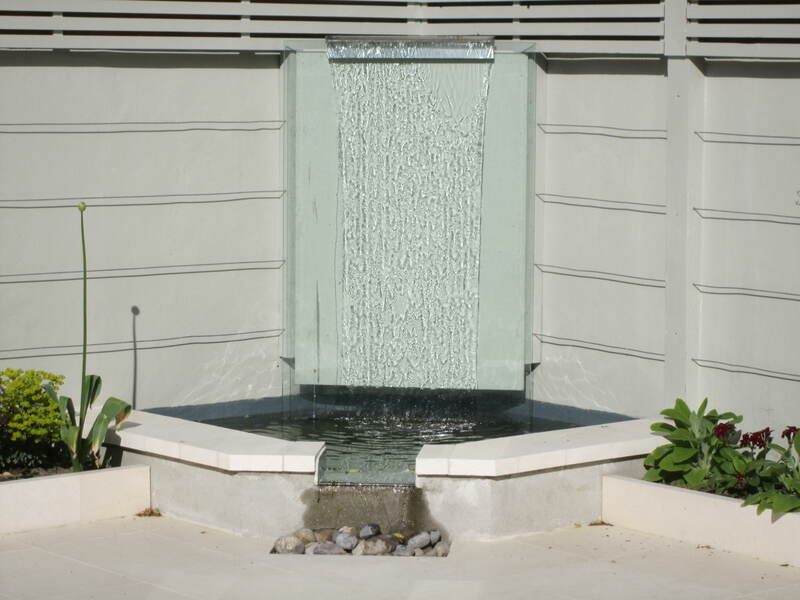 The waterfall was then constructed using Dunlavin stone and EPDM liner. The water fall was essentially 3 small ponds dropping into each other and were constructed that way on 3 individual pieces of liner. The header stones are the most important in the whole water feature and were hand picked from the quarry. They decided the look of the waterfall providing a flat surface for the water to drop off into the next pool. I used the con saw to sculpt the header stones. The filtration system, infra red box, pumps and hosing were then installed. The cleaning system for a Koi Carp pond is complicated but essential so I get professional help from the suppliers. Our landscapers then constructed the bog area adjacent to the pond to take any overflow. To create the bog we dug a hole 1M deep lined it with heavy duty plastic, Visquine being the best. Pierced the plastic all over with a fork and then re-filled the hole with sub-soil first then topsoil. Our landscapers then installed the raised beds using Dunlavin stone. The Dunlavin stone is quarried in Co Wicklow and is a very easy stone to work with as it shears easily into flat pieces. The walls were finished to a height of 50cm to double up as seating. Our landscapers then installed the hit and miss fence. 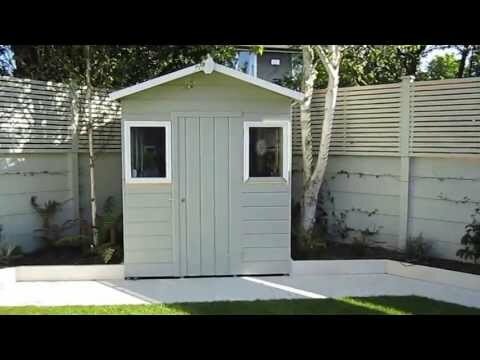 The timber used was pressure treated Irish pine. The posts were dropped into concrete, let set and then tied into the existing garden walls to strengthen. All the raised beds were then filled with good quality topsoil insuring all plants will do well and not struggle with existing soil problems. 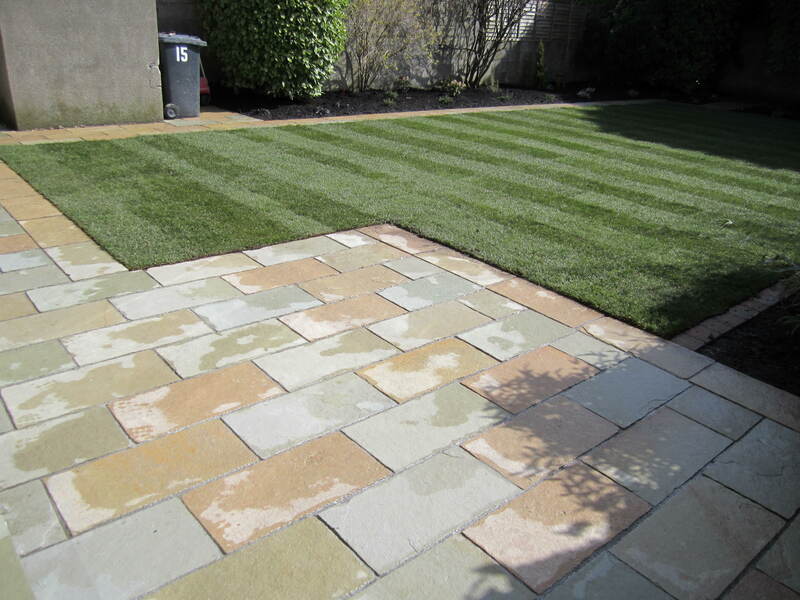 The 5M Indian sandstone circle was then installed matching up with the existing sandstone patio by the house. Indian sandstone is a beautiful stone but porous and must be treated with a sealer or it will discolour with algae and lichen. Our landscaping team then completed the planting using Mountain Ash trees, under-planted with ferns, shrubs, perennials, grasses and climbers planted by the fence to soften. 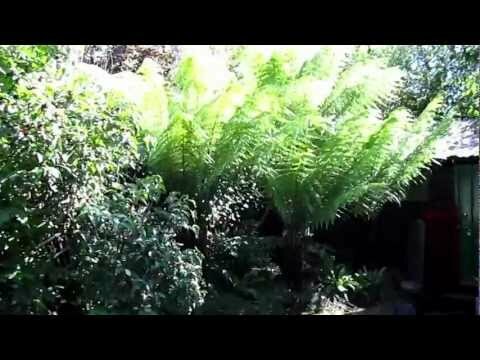 The low voltage garden lighting system used was a plug and go system which is easy to install and allows the client to add lights in the future or move lights as seasons change. 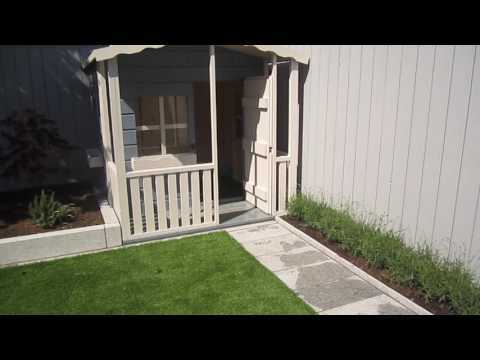 The lawn was an instant roll out lawn supplied by a reputable supplier and of top quality. This contract did not come in on time due to severe snow and ice but did come in within budget. The client was very happy with the results and is now the proud owner of some fine specimens of Koi Carp. 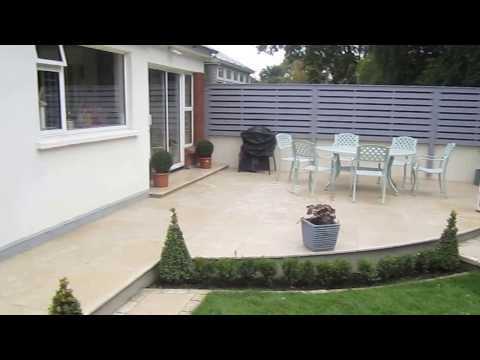 If you like what you see and require a professional landscaping service, call Kevin Baumann on 086 8198444. 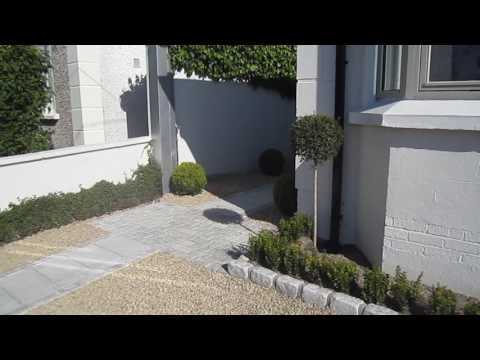 Previous: Garden Design and Landscaping, Monkstown, Co Dublin.